"On or about December 1910, human character changed." She was exaggerating — but only a little. Woolf saw a fundamental shift in human relations taking place at the beginning of the 20th century "between masters and servants, husbands and wives, parents and children." Those changes, she predicted, would bring about transformations in every sphere of life, from religion to politics to human behavior. Few would say she got it wrong. A century later, we are living through another transition. The way we connect with one another and with the institutions in our lives is evolving. There is an erosion of trust in authority, a decentralizing of power and at the same time, perhaps, a greater faith in one another. Our sense of identity is more variable, while our sense of privacy is expanding. What was once considered intimate is now shared among millions with a keystroke. More than anyone else on the world stage, Facebook's Mark Zuckerberg is at the center of these changes. Born in 1984, the same year the Macintosh computer was launched, he is both a product of his generation and an architect of it. The social-networking platform he invented is closing in on 600 million users. In a single day, about a billion new pieces of content are posted on Facebook. It is the connective tissue for nearly a tenth of the planet. Facebook is now the third largest country on earth and surely has more information about its citizens than any government does. 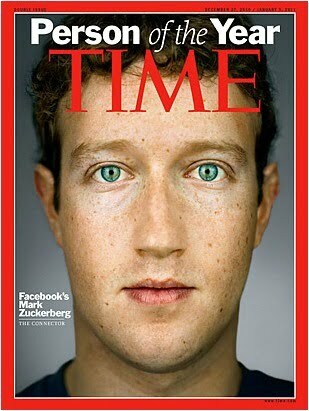 Zuckerberg, a Harvard dropout, is its T-shirt-wearing head of state. Evolutionary biologists suggest there is a correlation between the size of the cerebral neocortex and the number of social relationships a primate species can have. Humans have the largest neocortex and the widest social circle — about 150, according to the scientist Robin Dunbar. Dunbar's number — 150 — also happens to mirror the average number of friends people have on Facebook. Because of airplanes and telephones and now social media, human beings touch the lives of vastly more people than did our ancestors, who might have encountered only 150 people in their lifetime. Now the possibility of connection is accelerating at an extraordinary pace. As the great biologist E.O. Wilson says, "We're in uncharted territory." All social media involve a mixture of narcissism and voyeurism. Most of us display a combination of the two, which is why social media are flourishing faster and penetrating deeper than any other social development in memory. Social media play into the parts of human character that don't change, even while changing the nature of what once seemed immutable. Like two of our runners-up this year, Julian Assange and the Tea Party, Mark Zuckerberg doesn't have a whole lot of veneration for traditional authority. In a sense, Zuckerberg and Assange are two sides of the same coin. Both express a desire for openness and transparency. While Assange attacks big institutions and governments through involuntary transparency with the goal of disempowering them, Zuckerberg enables individuals to voluntarily share information with the idea of empowering them. Assange sees the world as filled with real and imagined enemies; Zuckerberg sees the world as filled with potential friends. Both have a certain disdain for privacy: in Assange's case because he feels it allows malevolence to flourish; in Zuckerberg's case because he sees it as a cultural anachronism, an impediment to a more efficient and open connection between people. At 26, Zuckerberg is a year older than our first Person of the Year, Charles Lindbergh — another young man who used technology to bridge continents. He is the same age as Queen Elizabeth when she was Person of the Year, for 1952. But unlike the Queen, he did not inherit an empire; he created one. (The Queen, by the way, launched a Facebook page this year.) Person of the Year is not and never has been an honor. It is a recognition of the power of individuals to shape our world. For connecting more than half a billion people and mapping the social relations among them (something that has never been done before); for creating a new system of exchanging information that has become both indispensable and sometimes a little scary; and finally, for changing how we all live our lives in ways that are innovative and even optimistic, Mark Elliot Zuckerberg is TIME's 2010 Person of the Year.